This article is originally from The Economist magazine, posted on 10/04/14. 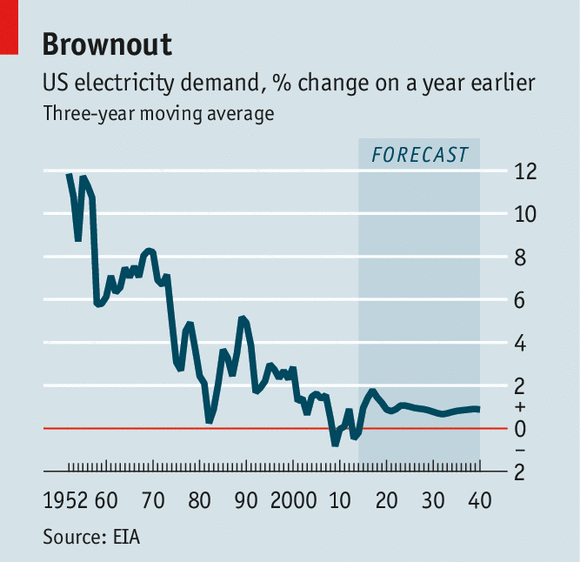 AFTER “rate hikes”, the most common phrase in America’s electricity industry these days is “death spiral”. The recession clobbered demand, and it has not recovered. Last year Americans used 2% less electricity than in 2007. The government’s Energy Information Administration reckons demand will grow by less than 1% a year between now and 2040 (see chart). Consumers are buying more electric gadgets than ever, but the power these machines use is tumbling. Electricity consumed by TVs has fallen by a quarter in five years. Tablets and laptops use less than desktop computers, and cloud computing means businesses need fewer power-hungry servers. And then there is “distributed generation”, which covers everything from household solar and geothermal systems to on-site electricity generation by large businesses and college campuses. All steal sales from power companies. The utilities are required to guarantee continuity of the electricity supply, which means they must keep spending on infrastructure and maintenance even as customers build their own power sources. So far the main response of the companies’ generally risk-averse bosses has been to propose building conventional generation and distribution projects, and to lobby regulators to let them raise their prices to pay for these—including imposing extra charges on customers who have solar panels. But this only makes “home-brew” electricity more competitive—so consumers buy even less power from the utilities, deepening the death spiral. Small wonder that analysts at Barclays bank recently downgraded the bonds of the entire American electricity industry. Given the utilities’ endless need for cheap funding, this was dire news: if investors switch off, that supply of money will shrivel. What the industry needs is a new business model. The best prospect, thinks Elias Hinckley, an energy-finance specialist at Sullivan and Worcester, a law firm, is plug-in electric vehicles. Today, Americans’ daily spending on energy can be split into two large chunks: about $1 billion on electricity and $1.4 billion on fuel for their vehicles. In the past, electricity providers had no way to tap into the latter market. Plug-in cars should change that. A modest 250,000 plug-in cars now glide silently along American roads, and they currently account for fewer than 1% of vehicles sold. But sales have been almost doubling each year (compared with about 5% annual growth for the entire car industry), and homes that own a plug-in car typically consume 58% more electricity, according to Opower, a seller of energy-conservation software. The Edison Electric Institute, a power-industry trade body, recently issued a report that called plug-ins a “quadruple win” for utility companies. In other words, they could help the industry increase demand, meet environmental goals, get closer to customers and cut costs by electrifying its own vast vehicle fleets. Power companies are not exactly rushing into the market. Some big ones, including Dominion, NRG Energy and Duke Energy, have between them installed a few hundred plug-in car-charging stations; some of them have pilot programmes that let owners sell power stored in the cars’ batteries back to the grid at times of peak demand. But none is partnering with plug-in carmakers to offer cheap installation of home chargers, and fewer than one in ten offers special tariffs to plug-ins’ owners—two lost opportunities that, says Mr Hinckley, “boggle my mind”. The utilities are standing by as firms such as ChargePoint, CarCharging and SemaConnect build networks of thousands of fast public and private chargers—inserting themselves into the customer relationship that plug-in car owners might have with electricity providers. The utilities, thinks Mr Hinckley, fail to understand that “they could literally own America’s future transportation infrastructure”. The picture is somewhat confused because, in America at least, early adopters of plug-in cars are often among the first to start generating their own electricity. Opower found that 32% of plug-ins’ drivers (admittedly in the wealthier, sunnier, western parts of the country that it surveyed) also have rooftop solar panels. The reduction in these consumers’ purchases of electricity from the grid, as a result of owning solar panels, slightly outweighs the increase from having plug-in cars, so they end up buying a little less power from the utilities than households with neither. What this may mean is that utilities enjoy a recovery in demand as plug-in cars become popular, then a renewed fall as solar kits (whose price has halved in the past five years) also become ubiquitous. Rich, sunny bits of America will see this phenomenon first, but it will surely come to the rest of the country, and other parts of the world, too. Nevertheless, it still makes sense for the power utilities to move swiftly into providing charging systems for electric cars, contracting with their owners to buy back energy stored in the vehicles’ batteries and indeed into installing and maintaining solar-power kits (as some already do). For these businesses have many years of growth ahead of them, unlike the power companies’ existing business. The utilities have a stark choice: sit back and be disrupted, or embrace the shock of the new.